Urban trails within Colorado Springs are an important part of the community. Urban trails are not only used for recreational purposes but also provide residents an off-street transportation system for non-motorized uses. Urban Trails in Colorado Springs are all designated as multi-use trails. This means that any non-motorized use of the trail is permitted. All of the trails are open to joggers, bicyclists, walkers, equestrians, roller blades, etc. The only exception to this rule is through Monument Valley Park, where deed restrictions prohibit equestrian use of the trail. Please follow trail etiquette while utilizing any trail. The current Urban Trail System consists of over 100 miles of trails, with another 100+ miles of planned trails identified in the Urban Trails Master Plan. The current trail standard is based on a "tier" system. Both Tier 1 and 2 trails are designed to accommodate a variety of Other Power Driven Mobility Devices (OPDMD) for people with disabilities who need to use a mobility aid. These trails are planned as with a hard primary surface with soft shoulders to accommodate all users. 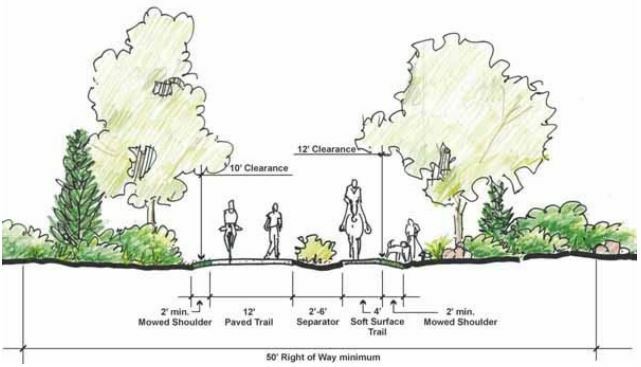 The standard for tier 1 trails is 12 feet wide hard surface with two to four feet of soft shoulder, with a preferred landscape buffer between the hard and soft trail surface. These trails have the same 12-foot wide standard found on tier one but without the landscape buffer. These trails are primarily gravel or natural surface with a width of four to six feet. The primary trail corridors will include three sets of north-south trails and three sets of east-west trails. They will provide access to major residential, shopping and business areas of the City.